Nuremberg: Anton Koberger, 1493. First edition. 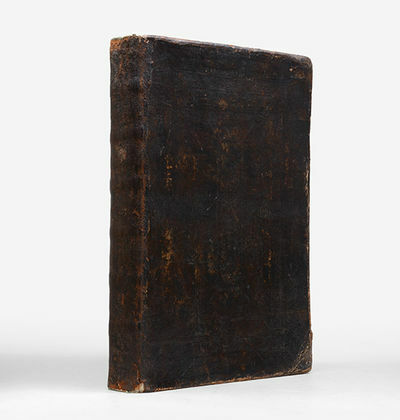 Tall folio, bound in full blind-tooled calf, metal clasps, raised bands. With the xylographic title and double-page map of Europe, and hundreds of city and town views and portraits. Text complete with leaves 1-299 each numbered and present. Minor wear and contemporary marginal notes and a few small repairs. A very attractive near fine example of this monumental achievement in printing. Hartmann Schedel was a medical doctor, humanist and book collector. He earned a doctorate in medicine in Padua in 1466, then settled in Nuremberg to practice medicine and collect books. According to an inventory done in 1498, Schedel's personal library contained 370 manuscripts and 670 printed books. He compiled this elaborate history of the world from "the first day of creation" to his own time in an effort to correct what he felt was a slight to German history by other chroniclers. He divided his work into the usual six ages of the history of mankind, adding a seventh in which he foretold the coming of the Antichrist, the destruction of the world, and judgment day. The invention of printing is mentioned on verso of leaf CCLII: "born in Germany... in the city near the Rhine [i.e. Mainz]... in the year 1440"; on verso of leaf CCXC is a brief account (not appearing in the subsequent German edition of the same year) of the "Portuguese voyage of discovery along the coast of Africa in 1483 , under the direction of Diego Cam and Martin Behaim of Nuremberg, which has been used as a basis for the unwarranted theory that the expedition reached America" (Sabin). The legacy of the volume rests on its illustrations. "There are 1809 woodcuts printed from 645 different blocks. They picture the major events of the Old and New Testaments, episodes in the lives of many saints, portraits of prophets, kings, popes, heroes, and great men of all centuries, freaks of nature, and panoramic views of cities. Nuremberg artists Michael Wolgemut and Wilhelm Pleydenwurff were responsible for the production of the book... The wood blocks were designed by the two masters and their assistants, including the young Albrecht D?rer, who was apprenticed to Wolgemut at the time. The printing was carried out under the supervision of the great scholar-printer Anton Koberger, whose illustrated books were famous throughout Europe" (Legacies of Genius 5). Koberger, Nürnberg 1493 - Original woodcut from the famous ,Nurnberg Chronicle&#146;, printed in Nürnberg, in December 1493. Uncolored city view, verso illustrated as well with seven small uncolored woodcuts of saints. German text edition. This view of Konstanz is one of the earliest obtainable authentic city views, published only a few years before 1500. This plate was exactly published and printed in December 1493 in Nurnberg at Koberger. In very good condition. On the full sheet as published. Minor mended stitch holes, as usual, at the centerfold. Nuremberg, 1493 - Woodcut, coloured, mm 255x540 (view) with text above, large margins. Very important incunable view. From the latin edition of "Liber Chronicarum", a milestone of illustrated travel-books and one of the most famous books of the 15th century. 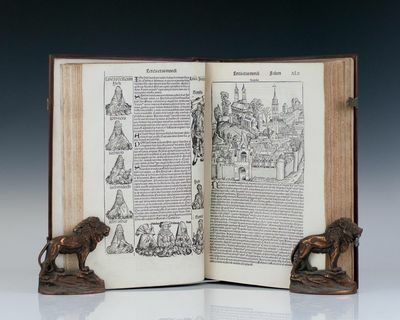 The views from "Liber Chronicarum" or "Nuremberg Chronicle" as it is commonly referred to, are among the earliest realistic obtainable views in the market. The engravings are all by Michael Wohlgemuth, teacher of Albrecht Duerer., and his stepson Wilhelm Pleydenwurff.Some restorations at centerfold as usual, mainly above and under the view. Koberger, Nurnberg 1493 - Original woodcut from the famous 'Nurnberg Chronicle', printed in Nürnberg, in December 1493. Fully hand colored city view. Verso illustrated as well with four smaller hand colored woodcuts of saints. German text edition. This view of Passau is one of the earliest obtainable authentic city views, published only a few years before 1500. This plate was exactly published and printed in December 1493 in Nurnberg at Koberger. In excellent condition. Schedel, Hartmann - Noah's Arch. Nürnberg Koberger 1493 - Kolorierter Holzschnitt von Wilhelm Pleydenwurff und Michael Wohlgemut, Bildausschnitt 19 x 51,5 cm., Blattgr. 42,5 x 60 cm. Erste Ansicht von Magdeburg in der Druckkgraphik, wohl zumindest teilweise nach der Natur dargestellt: im Vordergrund die Elbe mit Mühlen und Schiffsanleger, dahinter die Stadt, rechts wohl die Sankt-Jakobi-Kirche mit dem fertigen Südturm und dem Nordturm noch ohne Helm, mittig möglicherweise die St.-Johannis-Kirche und ganz links Magdeburger Dom. Aus der lateinischen Ausgabe von Hartmann Schedels "Liber Chronicarum"; mit knapp 2000 Holzschnitten ist die Schedelsche Weltchronik das am umfangreichsten illustrierte Werk der Inkunabelzeit. Michael Wolgemut begann 1487 zusammen mit Wilhelm Pleydenwurff, seinem Schwiegersohn, mit den Entwurfsarbeiten zu den Holzschnitten. Auch Beiträge des jungen Albrecht Dürer sind wahrscheinlich, der bis 1490 bei Wolgemut in die Lehre ging; wie immer in der Blattmitte restauriert, ansprechendes Kolorit, von guter Erhaltung. Nuremberg, 1493 - Woodcut in old colour, mm 392x580, good margins. From the latin edition of "Liber Chronicarum", a milestone of illustrated travel-books and one of the most famous books of the 15th century. This map has to be considered as the first modern map of this area; the author is Hieronymus Munzer. It has been engraved by Michael Wohlgemuth, teacher of Albrecht Duerer.Fascinating example beautifully coloured. Generally in good condition, the map bears a skilfull restored hole of c. mm 20x10 on both sides of the leaf, affecting Holland in the left half and Poland (Vistola) in the right. Ginsberg W.B. , 4. Nuremberg, 1493 - Norimberga, 1493. Silografia. mm 193x518 (foglio 440x596). Colorata, verso con testo latino. Tratta da "Liber Chronicarum" comunemente chiamato appunto "Cronaca di Norimberga": fu la prima opera con raffigurazioni reali delle città del mondo ed ebbe un enorme successo, tale da essere considerata una pietra miliare nello sviluppo della conoscenza geografica. Fu stampato in due edizioni, la prima latina nel luglio 1493 in circa 1500 copie, la seconda, tedesca, in dicembre dello stesso anno, in circa 800 esemplari. Le incisioni sono opera di Michael Wohlgemuth, maestro di Albrecht Duerer, del figliastro Wilhelm Pleydenwurff e del giovane Duerer stesso.Bell'esemplare con i consueti restauri al centro. 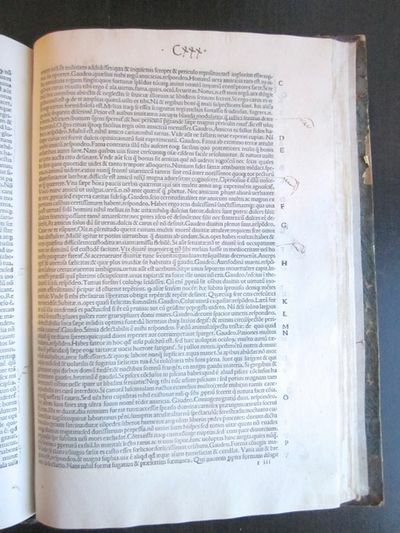 Woodcut, mm 193x518 (sheet 440x596), verso with latin text and nine little woodcuts including "Otto primus imperator". A good example with usual restorations at center.From "Liber Chronicarum", a milestone of illustrated travel-books and one of the most famous books of the 15th century. The engravings are all by Michael Wohlgemuth, teacher of Albrecht Duerer. his stepson Wilhelm Pleydenwurff and some are attributed to Duerer when he was young.The views from "Liber Chronicarum" or "Nuremberg Chronicle" as it is commonly referred to, are among the earliest realistic obtainable views in the market. MOSES. Blick in eine felsige Landschaft mit Ganzfigur des Moses beim Herabsteigen vom Berge Sinai, vorne die Israelten beim Tanz ums goldene Kalb. - Altkol. Holzschnitt von M. Wolgemut aus Schedel, "Weltchronik", 1493, 26,5 x 22 cm. Inkunabeldruck der lateinischen Ausgabe. - Auf der ganzen Buchseite. Verso 3 altkol. Hozschnitte,davon 2 mit der Bundeslade un den Cherubim, ein Holzschnitt mit dem Tisch für die Schaubrote und die Weihrauchbecher. - Aufwändig gerahmt mit Glasscheibe auch auf der Rückseite. DRESSER, Matthäus (1536 - 1607) Leipzig, Lamberg, 1602. 4o (18 x 14,5 cm). 6 Bl., 123 S. Mod. Pp. (Rucken leicht verblasst). Ungnadische Chronika, Darinnen der Herren Ungnaden Ankunfft, Aussbreitunge, Reisen, und Ritterliche Thaten verzeichnet werden. - Zweiter Druck der ersten Ausgabe. Geschichte der Familie Ungnad von Sonneck. Die Familie stammte aus der Steiermark in Slowenien. Hans Ungand von Sonneck (1493 - 1564 ) ist bekannt als der Sponsor von frühen protestantischen Drucken in der slowenischen und kroatischen Sprache in Bad Urach und Tübingen und als Mäzen von Primus Truber, Anton Dalmata und Stephan Consul. Der Autor Matthäus Dresser, auch Matthäus Drescher (24. August 1536 in Erfurt - Oktober 1607), war einer der letzten Humanisten des 16. Jahrhunderts, auch als Historiker für seine Zeit bedeutend. (ADB Band 5 (1877), S. 398&#150;401). Vorgebunden ein blauer Karton mit zusatzlichen Anmerkungen zu dem Geschlecht der Ungnad von 1646 bis 1705. Verso ein Kaufvermerk von 1776. Gebräunt, alt-hinterlegter Riss im letzten Blatt, einige Sätze unterstrichen, ansonsten gut erhalten. Pappband des 20. Jrh. \"Judicium Salomonis\". Mittig der König auf dem Richterstuhl, vor ihm die beiden Frauen mit dem toten bzw. lebenden Kind, rechts der Henker, dazu Gefolge. Mit ganzseitigem Text. Schedel\'sche Weltchronik. Berta etas mundi. Folium CCLV. - Altkol. Holzschnitt aus Schedel, "Weltchronik", 1493, 32 x 52 cm. Die älteste gedruckte Ansicht der Stadt in einem altkolorierten Exemplar aus einer lateinischen Ausgabe. Rückseitig mit der Ansicht von Ferrara (diese unten beschnitten). - Schönes, kräftiges Altkolorit. Gesamtansicht ('Bamberga. Mons.Honachorum - Babenberg').